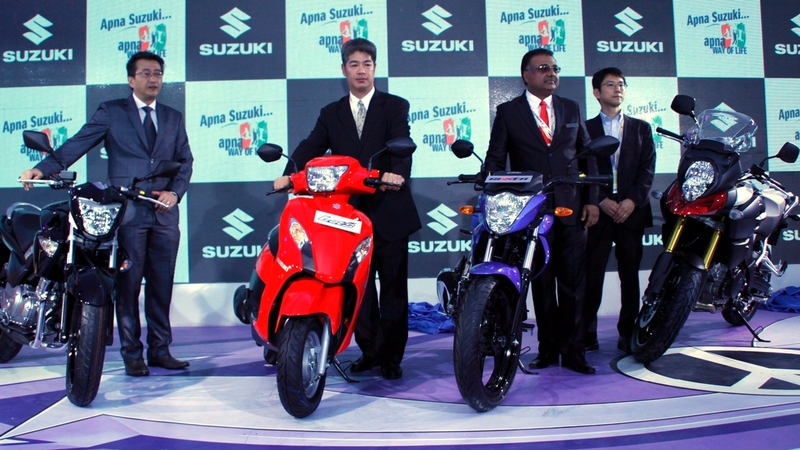 Well, so much was expected from Suzuki, but there has been nothing new except for the V-Strom 1000 along with the recently launched Inazuma 250, Gixxer 150 and the Let’s scooter at the Auto Expo 2012. The Gixxer 150 is Suzuki’s flagship model for the Indian market, boasting a new styling direction for Suzuki. The scooter Let’s is an offering directed at the urban youth looking for styling, economy and practicality. The V-Strom 1000 ABS strengthens Suzuki’s presence in the premium big bike segment. The new Suzuki Let’s scooter is practical, light and fast, it is powered by a light, compact, fuel efficient 110cc engine delivering a claimed 63 Kmpl. The Gixxer is one thing that we are keen to check out it seems to have a rather punchy engine and chassis for its segment. The Suzuki V Strom 1000 ABS motorcycle offers incredible versatility, comfort and is fun to ride. Sharing the spirit of the globally successful V-Strom 650 ABS, the all-new V-Strom 1000 ABS will deliver fun, excitement and on/off road experience to the open class rider who seeks a new world of motorcycling adventure. Size, weight, power, and maneuverability all come into balance within the V-Strom that comes power packed with V-twin engine and lightweight aluminum chassis.